Consistently satisfying Italian fare in an upscale dining room. : Downstairs, the Gentile family runs a small deli, casual dining room and wine shop, while upstairs is fine dining --- linen tablecloths, candlelight and knowledgeable waiters. Antonio's has been consistently good for years, the kind of place where the food isn't necessarily dazzling, but you can always count on the freshest seafood, nicely grilled meats, al dente pasta and a decent bottle of wine. 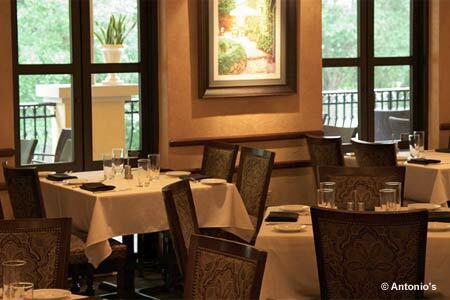 It's an ideal spot for a quiet business lunch or midday rendezvous. The menu offers many of the same dishes for lunch and dinner, mainstays like caprese salad, bruschetta, Caesar salad and potato gnocchi. The dinner entrées expand with more complicated dishes, like a veal chop stuffed with prosciutto, Fontina and spinach, or a rotisserie leg of lamb, wrapped in pancetta. The wine list offers plenty of Italian vintages and a handful of American choices. When Antonio's opened, the Gentiles dedicated Antonio's to the authentico spirito d' Italia, and the passion is still strong.